Ethiopian Airlines colorfully marked orphan children’s Christmas party on December 31, 2016 at its headquarters, providing the children drawn from fourteen humanitarian organizations with giveaway items and entertaining them with lively artistic performances. 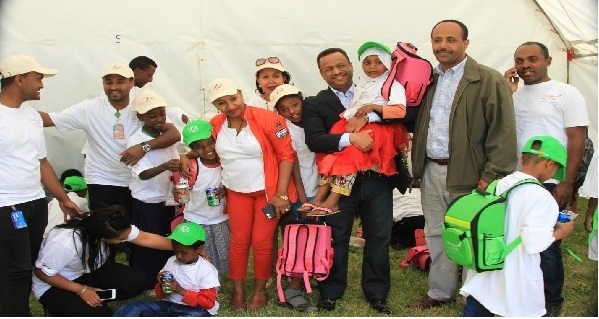 Present at the celebration were ET management staff, orphan children and parents from fourteen NGO’s, Ethiopian Brand Ambassador, Hanna Godefa and employees from different working units. The occasion was celebrated with a variety of proceedings including musical performances, question and answer competitions and experience sharing programs by the aviation academy trainees, nurses and technical sales staff. While delivering a keynote speech on the occasion, Ato Mesay Shiferaw, A/VP Corporate HRM at Ethiopian, said, “We are increasingly embarking on corporate social responsibility endeavors so as to sustainably ensure social and economic wellbeing of the children; and today’s Christmas party is a continuation of our commitments to be alongside the children and make them self-reliant citizens”. Playing a prominent role in creating a developed Ethiopia through its bold interventions that can greatly supplement the efforts in achieving the Millennium Development Goals (MDGs), the national flag carrier, Ethiopian, is aggressively discharging its responsibilities through alleviating economic challenges working alone as a company as well as in collaboration with different NGOs. Ethiopian has been celebrating Christmas with orphans for more than 10 years with different non-governmental organizations (NGOs) at its Headquarter.